Seed Starting: Things Are Looking Good! While I have started vegetables and flowers indoors from seeds in the past, my results have been spotty at best. Damping off, drying up, keeling over for no apparent reason — that’s the story of seed starting for me. This year, I changed several aspects of my approach and have been pleased — OK, bursting with pride — with the results. I’ve got about half a card table-ful of stout little seedlings of tomatoes, cucumbers, melons, sunflowers, peppers, and the special salvia for attracting hummingbirds that I heard about at the Rice County Horticulture Day in March. What worked this time that hadn’t before? Two things: Putting the plants where I can watch them closely and adding air circulation. Recently, I moved my office to the lower level of our home. It’s near a west-facing sliding glass door, so I set up the card table and simple shoplight right next to the desk. With the plants right there, I’m much more likely to notice that this tray or that one needs more water, more likely to rotate them so the seedlings get more or less even light, and more likely to notice that they need to be potted on. Because I can see them — and even smell them — I’m less likely to neglect them. The one trick with this location was how to hang the light. Since it’s a finished room, I did not want to drill holes in the ceiling and hang the lights. Instead, I commandeered a hanging rack from the laundry room and hung the light chains from hangars on the rack. It’s a bit odd looking — and yes, family members have asked a) when all the seed junk will be out of this room, which doubles as a TV room; and b) when the hanging rack will be available again for clothes. But all in all, it’s a great set up. The second improvement was the addition of a fan. I learned this from an article by Don Engebretson. A small fan set on low provides just enough air circulation to prevent damping off and other fungal diseases. 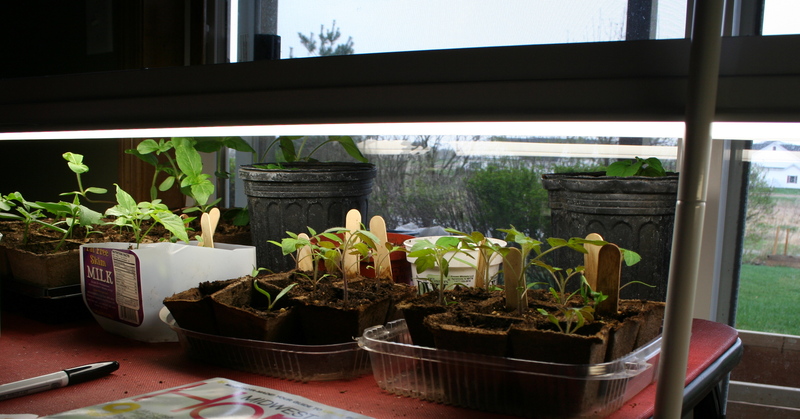 With the fan, the shoplight, the window for extra natural light, and my extra attention, the seedlings are thriving. The next challenge: Getting them safely into the garden. I’ll be reading up on hardening off seedlings over the next few weeks. I think I’ve read that the air movement from an fan, simulating wind pressure, can also help seedlings get stronger and sturdier — it makes sense that if they know nothing but still air there is nothing to make them develop muscles, so to speak. I am terribly behind – for various reasons I have done no garden prep yet this year. But I plan to spring into action now! I think you are right about the fan strengthening the seedlings. They seem to have thicker stems than earlier attempts. Plus it is so windy where I garden that it makes sense to get the plants used to it. Nice website. I found it in the Pioneer Press story. We’re Minnesotans temporarily located in Denmark. I started some tomatoes and basil inside and moved them out in early April. I had the spindly tomato problem and had read that you can plant them deep to encourage them to become thicker. I tried that and it worked quite well. Not sure if it’s the shock of moving them outside or the deep planting technique. I also tried the ‘up-side-down’ tomato in a plastic bottle. So far, so good. I can even move them inside at night, if it looks like the weather may be too cold. Thanks for stopping by, Rich. Planting tomatoes deep encourages them to root along the stem. I found this out last year when the branch of one of my tomatoes was laying on the ground and sprouted roots along the entire stem. I’ve tried the upside down tomatoes, too, but had very poor luck. I’m glad yours are going well. We also have started seeds and we’re having great success. This is our first time doing it. I’m actually afraid that I will have way too many viable plants for my garden. I am already reserving some for friends who would like them. My husband built a rather large bench for the basement with two tiers. Large enough to actually hold 16 flats total if we wanted to. The top tier has two shop lights with cheap sunlight spectrum bulbs and four flats of plants on top of a 4-flat seedling heat mat. Once the plants started to emerge we removed the clear tops from the flats and set up a personal fan aimed at the top of the bench where the “wind” is reflected down and circulates among the plants. They started doing really well when we realized they weren’t getting enough water and we started to water them more. The other half of the top tier I use as a potting bench and very soon I will probably have to transplant several of the plants into larger pots because the cell packs aren’t big enough for them anymore. I guess this is a good problem to have. We’ve purchased another heat mat and more lights for the bottom tier and the bigger plants are going to go there. Still have to get another small fan to put down there. I should also mention that the fan is on all the time and the lights are on a generous schedule with an automatic light of 6 hours darkness and the rest of the time light.